Posted By:Unknown | At:8:11 AM Be the first to comment! 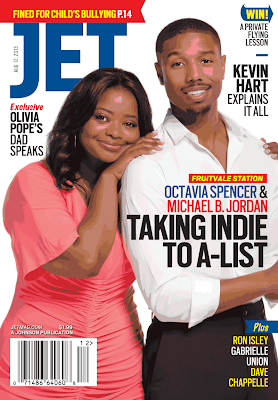 CHICAGO, Ill.— Johnson Publishing Company announced this week the first cover-to-cover redesign of JET magazine in the history of the publication along with the re-launch of theJETmag.com website. Led by Editor-in-Chief Mitzi Miller, readers can expect an overall modern and engaging feel that makes each section easy to read. “I’m very excited to debut the new look of the JET brand,” said Miller. “I'm proud to say that my team has created a product that strikes the perfect balance between freshness and familiarity. The new JET combines what our readers have always loved, with a modern look and vibe. I look forward to the continued support from our loyal readers and embracing a new generation of JET subscribers." The cover of the new issue features Oscar winner Octavia Spencer and NBC’sFriday Night Lights actor Michael B. Jordan, who both star in the critically acclaimed filmFruitvale Station. Spencer and Jordan gave JET the details on preparing for the roles and their emotions that were sparked while reenacting the tragic story of Oscar Grant, a young Black man who was killed by a police officer in 2009. The film hits theaters nationwide on July 26.